NASCAR Racing 1999 Edition does not work with my V2200 8MB PCI card. Not in Windows 98SE, nor in DOS. I use the latest Hercules driver version 0.85. But it works fine with the "BigRRed" glide_wrapper, even on a Pentium200. If your game is installed in "C:\ICR2", you can use my files without modification. Now the game works without artifacts in the mirrors, but it also disabled anti aliasing in them. Last edited by falloutboy on 2016-9-15 @ 09:57, edited 2 times in total. You don't accidentally have a fix for that lying round for that one either ? 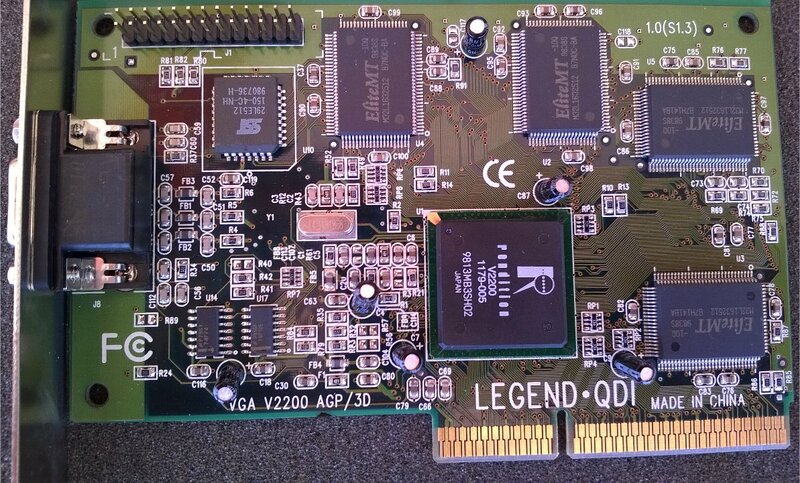 For NR1999: I switched the QDI with an Thriller 3D 4MB card during the last tests and that card runs NR1999 with no problems with the 0.85 driver. I'm currently re-applying an OS Image without drivers and then I'll plug the QDI back in to test it for you. I think I used the same driver and it worked with no problems. NR1999 works for me with a QDI Legend 8MB AGP and Hercules 0.85 driver. No special things to do. The spd3d.uc in the gamefolder is from 1996-10-25 and has 56KB size. What is yours like? I attached mine if yours is different. Thank you for testing NR1999. It's probably just my game version. The spd3d.uc file seems to be the same. There seems to be a problem with emm386, Rendition & Scorched Planet, but probably not your problem? Problem: There have been reports of lockup problems running Scorched Planet with Rendition Verite based cards. The symptoms are that Scorched Planet presents you with a black screen upon running it. The problem is due to compatibility problems between the Rendition's own driver library, Speedy 3D and emm386. 2) If #1 doesn't work, try removing or commenting out EMM386.EXE from your config.sys file entirely. You may wish to prepare a boot disk as an alternative solution at this point. Maybe just try every spd3d.uc file you can get. Under Windows Dosbox i get a black screen with Scorched Planet. Under DOS I get a corrupted screen as in my picture some posts earlier. I found 8 different spd3d.uc files but all show the exact same result. "Could not open Verite. Error code 20:03"
what am I missing? Do I need another spd3d.uc file ? So I was looking at vogonsdrivers, in the "Rendition - QDI Vision-1 BIOS/Drivers" package. So 1.44 is a newer version, before I flash it , is there a point to save the older BIOS or something? Anyone needs it? Are there NT4 OpenGL Drivers for Verite 2100/2200 ? jacco wrote: Ok nobody have it and pm me nothing . Now i have a cheap kasan blitz 2200 card from a friend . What is a second and thirds connector? Is it 3D shutter glasses interface like on older Kasan vga cards? Or is it only normal TV-out? Yes some V2200 cards optionally had 3D shutter glasses support. But I think the above card just has Svideo and composite video. Thank You. It is strange one of main shutter glasses producers dropped this feature. Kasan´s older product (S3 and Trident) were with connector for glasses. I've got a problem trying to get Nascar Racing 2 (the Rendition version) running in MS-DOS 6.22, with a QDI Vision 1 card running in tandem with a Voodoo2 SLI config. When running in Windows 98, it works fine, including if I reboot into DOS mode. However in Pure DOS 6.22, the game fails to detect the card, so it doesn't run. Any ideas? Are there Rendition drivers for DOS or something that I need to apply? It's a V2200 card and the game looks for V1000, I guess? There's a utility to patch older Speedy3D games to recognize V2200 cards. It's on VOGONS Drivers . swaaye wrote: It's a V2200 card and the game looks for V1000, I guess? There's a utility to patch older Speedy3D games to recognize V2200 cards. It's on VOGONS Drivers . That's interesting. Maybe the Glide version didn't get as much optimization. Well the 3DFX patch was only a beta. It's advantages over the Software & Rendition versions include: Anti-aliasing, fog & ability to take screenshots. However the anti-aliasing function causes a line to appear in the cockpit view whenever its turned on. Also trackside textures like signs etc. are blurred in 3DFX mode, and the frame-rate is still iffy when the on-screen action is busy. Who here is familiar with the "RR.EXE" application (essentially displays an Animated Rendition Logo, then quits) that comes with the Rendition version of at least CART Racing? It puts my monitor into an odd resolution and/or refresh rate. Does anyone know if it's possible to alter this app's resolution/or refresh rate at all? Secondly - i'm trying to get CART Racing to work properly with my QDI V2200 card. I've installed the rendition version (pure DOS 6.22), and it works straight out of the box even in DMA/FAST mode, without editing any of the batch files - All I had to do was just run v2dosfix first on both the RR and CART executables. HOWEVER, i've still got the screwy mirrors, and i'm just trying to make sense of that old Bjorn's 3D world article. Why is he commenting out the SET SPEEDY3D lines in his batch file? Surely that would turn DMA mode off? Secondly, does anyone know why we have to run the game first with the original SPD3D.UC file and THEN exit & run it with the fixed version? Why can't it run with the fixed version straight awway? Hm stupid the OpenGL ICD does not work on NT4, and the Driver seems todo only sturdy 2D. Anyone knows howto enable 3D on NT4 using a Rendition ? The new chips were designed for Microsoft Windows 9x and NT 4. So the 2x00 Generation should do 3D on NT4 right ? except D3D. Does anyone have the Video BIOS for Diamond Multimedia Stealth II S220 which makes the V2100 to V2200 ? matze79 wrote: Video BIOS for Diamond Multimedia Stealth II S220 which makes the V2100 to V2200 ? Have you tried one of this package. glquake still does not work on nt4, damn it. it seems gl is only supported on 9x ?